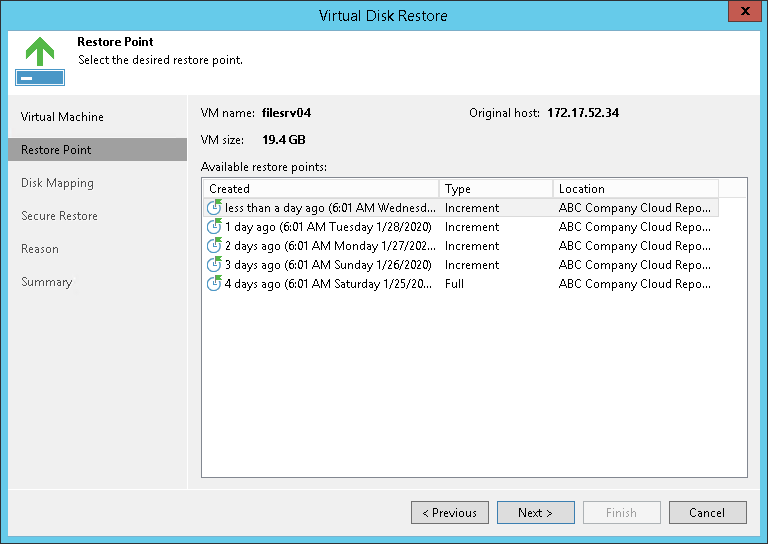 You can restore virtual hard disks of VMware VMs from the backup. The restored disks can be attached to the original VM (for example, if you need to replace a corrupted disk) or mapped to any other VM. 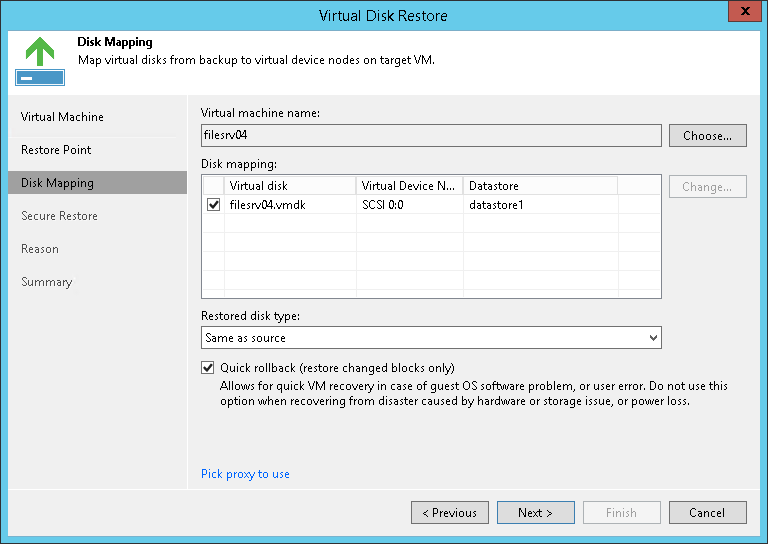 This section describes only basic steps that you must take to restore virtual disks of a VM. To get a detailed description of all settings of the restore process, see the Restoring Virtual Disks section in the Veeam Backup & Replication User Guide. Select the Backups node in the inventory pane. Expand the backup job in the working area, right-click the necessary VM in the backup job and select Restore virtual disks. At the Disk Mapping step of the wizard, click Browse and select the VM to which the restored hard disk(s) must be attached. Select check boxes next to the virtual hard disks that you want to restore. To change the disk format, select the required option from the Restore disks list: same as on the original VM, force thin or force thick. Select the VM disk in the list and click Change. In the Virtual Disk Properties section, select a datastore where the restored hard disk must be located and select a virtual device node. If you want to replace an existing virtual disk, select an occupied virtual node. If you want to attach the restored disk to the VM as a new drive, select a node that is not yet occupied. [For hard disk restore to the original location and with original format] Select the Quick rollback check box if you want to use incremental restore for the VM disk. Veeam Backup & Replication will query CBT to get data blocks that are necessary to revert the VM disk to an earlier point in time, and will restore only these data blocks from the backup. Incremental restore significantly reduces the restore time and has little impact on the production environment. At the Summary step of the wizard, select the Power on VM after restoring check box if necessary.